Penguin Random House UK today announced it had signed an ‘Agreement for Lease’ for a new London office, One Embassy Gardens. One Embassy Gardens will be part of the Nine Elms riverside development between Vauxhall and Battersea. Penguin Random House plans to occupy 83,400 square feet across floors one to five, and it will have a dedicated reception and event space on the ground floor. The publisher will continue to occupy its existing office at 20 Vauxhall Bridge Road, Pimlico, which is a short walk from One Embassy Gardens. Penguin Random House aims to move all its London employees into one of these two sites at the end of 2019, vacating its Ealing and 80 Strand offices. Both One Embassy Gardens and 20 Vauxhall Bridge Road will be home to a mix of Penguin Random House departments and CEO Tom Weldon, among others, will work at both offices. John Mulryan, UK Managing Director, Ballymore commented: “We are very pleased to welcome Penguin Random House to Embassy Gardens. With the forthcoming opening of the new US Embassy and the recent announcement of Apple moving its headquarters to the area, this gives further momentum to this remarkable place of regeneration. One Embassy Gardens is the flagship commercial building at Ballymore’s Embassy Gardens development in Nine Elms, London. The 215,000 sq. ft. office building has been designed by Lee Polisano of PLP Architects, known for the City of London’s Heron Tower. It has exceptional commercial space over ten floors and a unique 360 degree roof terrace and winter gardens with spectacular views over the River Thames and central London. Embassy Gardens is a riverside district in the heart of Nine Elms. 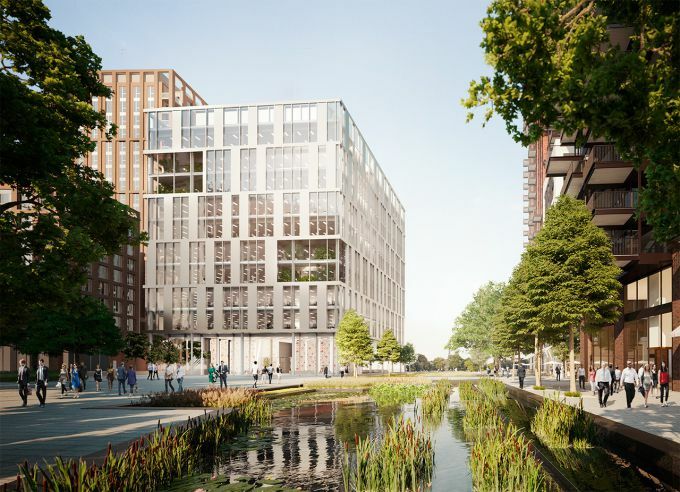 A short walk from Battersea Power Station and soon to be connected by two new tube stations, riverboats and a new Thames crossing, it is attracting investors and residents from across the globe. The architectural style is distinctive, with buildings standing amongst landscaped public squares, parks and spectacular gardens. Amenities of the highest standard include the private Eg:le club with its own library and gym, the world-famous Sky Pool, as well as a spa, cinema and business facilities. With the relocation of the US Embassy to this area, directly across the river from Pimlico, and the nearby regeneration of Battersea Power Station, Embassy Gardens is the centrepiece of the last great new district in the centre of London. The project as a whole will include up to 1,750 new homes a broad range of shops and restaurants anchored by Waitrose and over 20,000 sq. m of office and flexible workspace spread over eight building plots rising up to 23 storeys in height. Penguin Random House is the world’s number one publisher. We champion authors, shaping and sharing writing that sparks thoughts, dreams, conversations and learning. We are a vibrant community of publishing houses, representing distinguished publishing histories marked by unparalleled success. We are a home to all kinds of authors. From the best new fiction or picture book writers, to political commentators, trailblazing entrepreneurs, health experts and bold illustrators, we enable talented people from all walks of life to tell their stories – and we make sure they are heard. As the only global publisher, we sell and license books in over 120 countries, connecting great books with a growing and global audience.